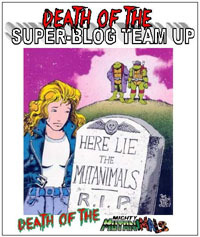 Summary: Lois Lane reports on the destruction of Bludhaven and the response of the super-heroes. This issue is another logoed Infinite Crisis crossover issue. This is where we get the immediate response/fallout to the destruction wrought by Chemo in Infinite Crisis # 4. Rather than dialogue and seeing "inside" the heroes’ reactions to that event, we get it from the perspective of some citizen of the DCU reading reporter Lois Lane’s article covering the heroes’ response as she observed it. This makes for an interesting perspective, if not entirely original. The "narration" is simply Lois’ story, which provides the only words found in the otherwise "silent" issue. One moment that stands out to me offhand is a full-page panel of Green Lantern amidst the wreckage, obviously deeply pained over the event. I believe this would be apparent even without Lois’ observation. My initial reaction to this being where the plot thread gets immediately dealt with was surprise–given that many characters have "signature cities" that are often as much a character as any humanoid supporting cast member. Shouldn’t this be dealt with in another book? Except of course, Superman being Superman is obviously going to help. And given that Superman’s so powerful (here, the specific focus is on his invulnerability), it’s not like the character’s going to stand by and let others die just to maintain some "image" or such. 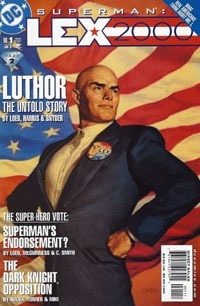 The style of this issue remind me of the Superman issue (# 79, I believe) that was told in this same way, except it was Ron Troupe’s story scattered in the otherwise silent issue which showed the Cyborg Superman stopping an attempt in the White House on the president’s life, and that president’s endorsement of the Cyborg as the "real" Superman. Given the destruction the characters rally to face, I’m also reminded of the "Black Cover Spider-Man Issue" (Amazing Spider-Man v.2 # 36, I believe). Getting the story simultaneously after-the-fact (Lois’ words) and as it unfolds (the visuals) works pretty well–and for the most part might be the only way to truly cram so much into one issue. If there was dialogue with us seeing/hearing the characters talking to each other and coordinating and whatnot, this issue would have be be double, triple, or even quadruple-sized. On the one hand, it’s interesting that there are four people listed for the writing–three beyond regular writer Greg Rucka. I can give the benefit of the doubt on it to the writing style and giving voice to Lois’ writing, as journalistic writing is not quite the same entity as character-writing and may be more collaborative. Visually, there’s a fair amount of blank-space on these pages, as the images are pretty much contained to panels, and those panels’ layout tends to somewhat resemble photos placed on a fixed-size page. Though the art is not by a single person, it works for me here. I found myself reading the text, using the visuals almost as an abstract, seeing them but not diving in deeply. Letting the visuals enhance what I was reading. No real complaints with the art–it’s not perfect by any means, and this issue continues a trend of having "extras" credited, assumably to get an issue out exactly on-time (given what it covers, this issue pretty much had to be out right after Infinite Crisis # 4. Same week, and someone reading this issue spoils a major part of that issue; two weeks after, and it’s old news compared to books that also touch on the ramifications. Other than describing how some of the mess is specifically cleaned up quickly (which might be mentioned in other books–I don’t know), this issue doesn’t strike me as essential reading. It will enhance one’s reading of the overall Infinite Crisis event, though. 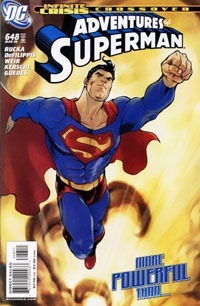 The issue doesn’t even have to be a Superman one–this could almost have been labeled "The Daily Planet – The Day After Infinite Crisis # 4" and been a "special" or "supplement" issue. My initial reaction to the issue was that it wasn’t all that good, but it is actually quite well done, and serves its purpose as a followup to one of the more catastrophic events in the DCU. This is another volume that I was ‘sold’ on by virtue of it being $9.99 and thus the chance to try a new series on the cheap (functionally $2.50/issue rather than $3+). Lazarus is a story set in the future, a world wherein Families run things, and a sort of caste system: core Family at the top, a serving class, and “waste” at the bottom. The term Lazarus applies to a Family’s “champion,” someone who seems genetically engineered to be the epitome of that Family and a sort of enforcer or military type function defending the Family’s interest. This first volume introduces us to the Carlyle Family and their Lazarus, Forever Carlyle. As the Family deals with a recent attack by a rival Family, Forever is sent in to make peace, though some in the Family don’t want peace and so lash out, with rather painful results. Only four issues in, I can’t say that I feel all that vested in the story…while I’ll admit to curiosity at where things will go, it hasn’t particularly hooked me to where I’ll eagerly seek out single issues or the next volume. It’s an interesting concept, though, with the family intrigue; secrets and betrayals; sort of a futuristic Game of Thrones type thing. The art doesn’t exactly do much for me…though that’s not a bad thing here. I had no problem following the story, and even the almost too-frequent “silent panels” seemed to get things across quite well. I did definitely appreciate the lack of full/double page splashes as those tend to really chew up pagecounts pointlessly. 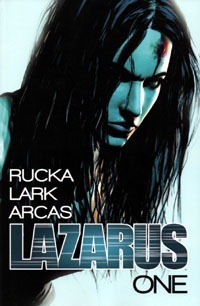 I suppose Rucka‘s name on this would actually be another “selling point” for me, and while this volume’s failed to really hook me, Rucka‘s name and the curiosity I do have means I’ll probably snag the next volume once I notice it’s out, to see if a few more issues’ worth of content do what these didn’t. All in all, though…not bad for a $10 volume, and it definitely does far more toward getting me to be willing to continue with the series than just a single issue or two would have done.